Is Salt of the Earth worth the money? Have you tried the world of nicotine salts yet? It’s a form of more concentrated e-liquid that is not designed to be used in a traditional vape tank. It’s meant to be used in a refillable pod system. I haven’t tried too many of them yet, but I’ve enjoyed the ones I have used. Salt of the Earth is no exception. I was sent five flavors from Salt of the Earth, which is designed by Blu. I have always been a Blu fan, so I was excited to give this new nicotine salt line a try. 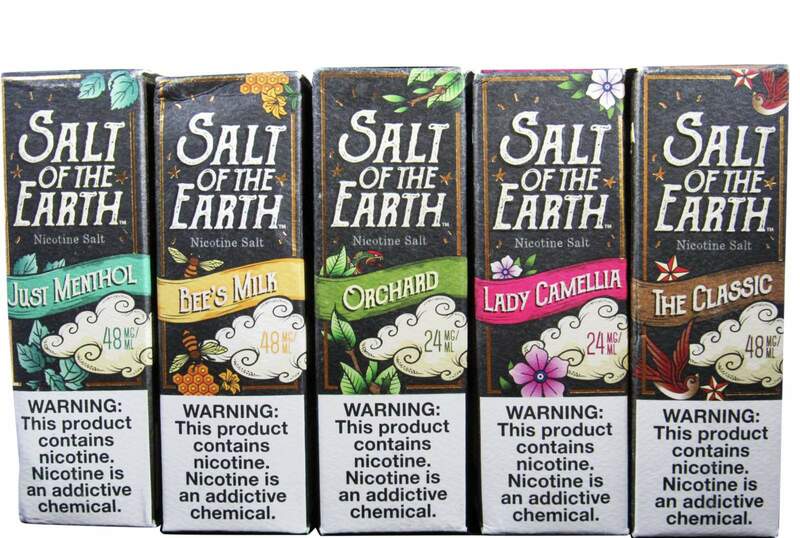 Salt of the Earth sent me five flavors: The Classic, Just Menthol, Bee’s Milk, Orchard and Lady Camellia. Now, I have to admit, I like when the names of the flavors have a little something to do with the actual flavor. I do not like having to do a google search to get an idea of what I’m dealing with before I try it. But, at the same time, that’s a personal thing. But, with Salt of the Earth, I had to do a google search to get some details, even after I tried the flavors. The Classic has a very telling smell and taste. It’s a good strong tobacco flavor. Just your general, I-like-my-vape-to-taste-like-tobacco flavor. Now, don’t get me wrong, The Classic does not taste like a stinky cigarette, but like a flavorful tobacco leaf. When shopping for my own juice, I do not lean toward tobacco flavors, but that does not mean I cannot appreciate a good one. I enjoyed The Classic by Salt of the Earth. Let’s talk about Just Menthol by Salt of the Earth. Want to hazard a guess as to what it tastes like? A good, strong menthol flavor. Again, I am not known to shop for menthol, but I can tell a good one. Just Menthol by Salt of the Earth has a pleasant menthol-tobacco combination, so it’s not straight up menthol, which can be over powering. If you are a menthol lover, I would give Just Menthol a try. Salt of the Earth’s Bee’s Milk is a blend of milk and honey. It really did not wow me, but, then again milk and honey are not flavors I enjoy and especially not together. It was a rich flavor, but just not for me. If milk and honey together are your thing, you’ll probably love it, because it lives up to its name. Now onto Orchard. This one was by far my favorite. It’s so sweet and strong and pleasant, all at the same time. Blu describes it as “Our unique formulation makes this familiar flavor the perfect blend of sweet and tart. Just like a crisp apple ready to harvest, this one will be your go-to pick.” I have to say I loved this one, with the strong apple base to the flavor. I’ll be ordering more of it. Uh, ok, I can tell you I got the floral. Like a whole lot of floral. Like too much for me floral. But, I did get some peppermint in there too, which I enjoyed. Lady Camellia by Salt of the Earth has an awesome smell, but it did not wow me. The Salt of the Earth nicotine salt line is available in two different strengths, 24 mg and 48 mg. Remember, these are different than regular vape juice, so do a google search if you are not sure which strength would be better for you. The Salt of the Earth line sells for $18.95 for a 30 ml bottle. To me, that’s not bad. I like when my juice costs less than $20 for a 30 ml bottle. And, overall, I would say that I was happy with the Salt of the Earth line. There wasn’t one I flat out didn’t care for, but I did like some more than others, which is typical. If you’re looking to try something else, or are venturing into the world of nicotine salts, give Salt of the Earth a try, you may find yourself impressed. The best place to buy Salt of the Earth nicotine salts is from Direct Vapor. Previous articleUniversity Vape Study Funded By FDA – What Are They Looking to Prove?